Fashionable guest he's so cute! Surprisingly, I awoke feeling some what refreshed yesterday morning. Maybe, it had something to do with the potent cocktails consumed the night before? Usually, one would of thought that they would work in the opposite way, but I was not complaining. I always look forward to the Raffles school of Design and Commerce show, as it displays emerging designers incredible talent and hard work. The group show featured students, Winson Tan, Crystal Tsoi, Ayaka Ichikawa and Gabriel Lee. My mouth dropped when Malaysian designer, Winson Tan's collection took to the runway. It was amazing. The inspiration was drawn from the rain forest and was a mix of beautiful, vibrant prints and bold hues. Stylist Tristan Q, Fashion blogger Emily Fang and I were a sparkling trio on the final day; all dressed in some form of sequins. I promise you that this was not planned in anyway at all. After spending the whole week together, ESP must of started to sink in. 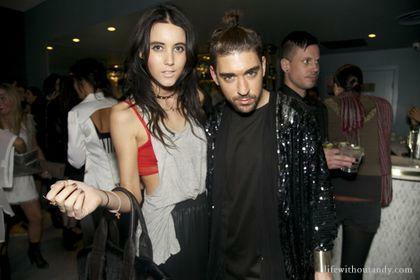 I was super comfortable in the Sass & Bide jumper dress, which features gold sequin detailing. Uscari was presenting their new collection in the New Generation show, so I paired Uscari sheer mesh leggings, which they had made for me under the sweater dress, with my chunky JC pony hair platforms. At about 3pm, I did hit a bit of a wall. I was declining into a state of delirium, so the couch was my best friend for a few hours, before attending some fashion week wrap up parties. The night did start off on a rather annoying note. I had just arrived in the cab to the Uscari after party at Beach Haus and was all ready for a well deserved vodka or 2. Note to self; When changing hand bags in a tired state, remember your bank card! The good old meter ticked its way to 50 dollars,when usually it would be less than 20. Everything summited from then on, finally arriving to the Uscari after party, then to the Yen Magazine/Facehunter event at the Backroom.